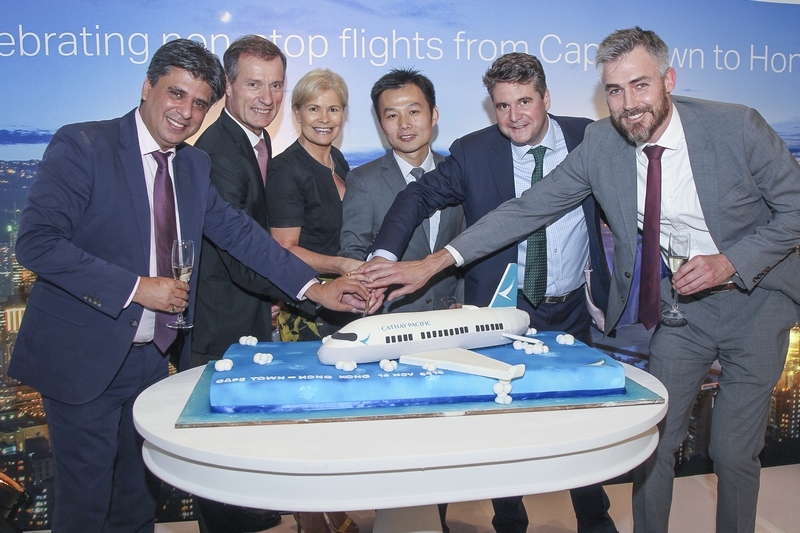 Cathay Pacific has celebrated the launch of its non-stop service between Cape Town and Hong Kong. The latest route in the airline’s network heralds the first non-stop link between the Western Cape and the heart of Asia. Cathay Pacific Flight CX794, operated by the Airbus A350-900 aircraft, departed Cape Town International Airport today, marking the commencement of the airline’s second South African route and is the latest in its rapidly expanding network. The new seasonal Cape Town – Hong Kong service, the first direct link between the two prominent business and leisure tourism destinations, boosts South Africa’s accessibility and complements Cathay Pacific’s existing daily non-stop flights between Johannesburg and Hong Kong. Departing passengers on CX794 enjoyed a special ceremony to celebrate the launch with refreshments and a traditional Chinese lion dance performance. Cathay Pacific also celebrated the new service at an event on 13 November, featuring guest of honour, Minister Beverley Schäfer, Minister of Economic Opportunities, Tourism and Agriculture for the Western Cape Government. Sutch added that the new service will also boost travel to other destinations on Cathay Pacific’s network, as it provides excellent connections from South Africa to popular destinations like Bangkok, Denpasar (Bali), Shanghai, Taipei and Tokyo, via its Hong Kong hub. Tim Harris, CEO of Wesgro, the official tourism, trade and investment promotion agency for Cape Town and the Western Cape, added that the new service will meet customer demand for travel to the region – home of the Mother City, the Cape Winelands, and pristine, picturesque beaches. “We are thrilled that our city will now be linked to this popular business and tourism destination – creating increased opportunities for business, investment, travel and trade. By connecting the Cape directly to China for the first time, we hope to see a marked increase in tourism and investment into our region,” he said. Hong Kong gives more South African travellers the chance to experience one of the world’s most popular business and leisure destinations. Experience Hong Kong’s delicious street food freshly made to order, or head to Victoria Peak on Hong Kong Island for a view of the city and harbour. Cathay Pacific has expanded its long-haul network significantly in recent years. In 2018 alone, the airline has launched new services to Brussels, Dublin and Washington DC, while Cathay Dragon, the regional airline of the Cathay Pacific Group, has commenced flights to Davao City in the Philippines, Jinan and Nanning in mainland China and Medan in Indonesia.